Rare Night of the Living Dead 1990 Blu-Ray: mine! Heck yes! 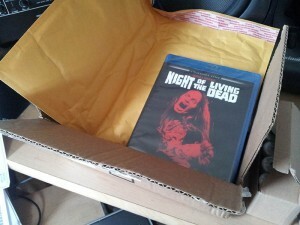 I just got my super-rare sold-out Blu-Ray copy of Night of the Living Dead! This is the 1990 version directed by Tom Savini. I won this from a giveaway over at Cinema Lowdown, and I recommend you check them out because they make dreams come true. This release is somewhat controversial, for a couple reasons. First, the color timing is dramatically altered from the original release. Secondly, Twilight Time only made 3,000 of them! For more info regarding these controversies, check out Cinema Lowdown’s interview with the Director of Photography from the film, Frank Prinzi ASC. This entry was posted in Uncategorized and tagged horror on January 7, 2013 by Bellsauce.